Hi, I am a Christian with bipolar disorder and living in Singapore. Bipolar disorder (manic-depressive illness) is mood disorder with extreme mood swings. It is a medical condition that can be treated with medical and other helps. I enjoy writing, photography and making bookmarks and homemade crafts and gifts. I hope to share with you about God's goodness and mercies to me and His sufficient grace through the ups and downs in my life in my struggle with bipolar and other challenges. May all praise and glory be to God! A story of bipolar disorder : does it sounds like you? How to tell family or friends I have bipolar disorder? This blog is for me to share my experiences and information I have found, or resources I have found useful. This is not a place for self-diagnosis. But if you recognize some of these signs and symptoms in yourself or your loved ones or friends, you/they may need medical attention, please consult the medical physician. My brother took this lovely photo at Muriwai Beach, Western Auckland, New Zealand. Thank God for His reminders through His Words and His providence daily that He cares for us. He has promised in His Words in 2 Corinthians 12:9 that His grace is sufficient for us. This is a tremendous encouragement to me in this pilgrim journey. Even as a Christian, I continue to face various and many challenges in life just like every one else. I go through time of wellness, sickness, success, failures, happiness, disappointments, life, death, etc etc etc too. Being a Christian does not exempt me from the trials and difficulties in this life. Having bipolar disorder or manic-depressive illness, can make life very difficult for myself and others. The greatest comfort for me in this personal trial, is that God loves me and is sovereignly in control of every situation in my life and His grace is sufficient for me. Even in allowing me to have bipolar disorder, His love and faithfulness remains unchanging. In fact, it is through my struggles with the 11 or so severe depression episodes over the last 20 years, that I am drawn closer to God to know Him and His love better. I have found His promises to be true and His grace sufficient as He promised It is God that sustained me through many painful and prolonged suffering from clinical depression. At times when I am confused by what I was going through and others could not understand either, the Lord has kept me in the palm of His hands. In His love alone, I found that enduring and unconditional love. It gives me the strength to face each day. Thank God that He is with us always. He will continue to give us the grace to walk with Him and serve Him, even if we have to go through the valley of the shadow of death at times. And when our tasks here are accomplished, we have the blessed hope of being with Him forever to enjoy His love and fellowship for all eternity. What a blessed hope! Meanwhile, let us press on joyfully in His strength daily. When we are weak, He is strong and His strength is made perfect in our weaknesses. Praise Him! Hope this verse will encourage you today and everyday. May you continue to know God's grace that is sufficient for you through all the changing scenes in life and His love that is unchanging and everlasting. Have a blessed day! I use this photo to make the following Bookmarks. If you wish to make the bookmark yourself, you can download the respective Free Bookmark Template. 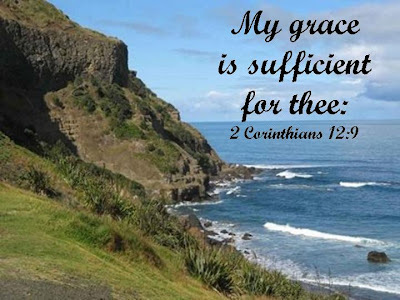 1) 2 Corinthians 12:9 "My grace is sufficient for thee". Check out Free instructions on how to make Bookmarks. If you love something, set if free. If it comes back to you, it's yours. If it doesn't, it was never meant to be. Thank you nancie, you have been so sweet and encouraging through all this:) I enjoyed reading this post very much!! I love your bookmarks they are so cute, me and mom were thinking about making them!! I love having hobby's to do!! God bless and stay sweet!! Thanks, for your encouragements too, Jennifer. Glad you like the bookmarks :) I love to make bookmarks and do other craft works. They helped me to relax and make excellent gifts for family and friends too. Happy making your own bookmarks! Take care God bless. okay.. now I'm really laughing Nancie! because I offered a bookmark this week for WFW on my blog too! what are the odds of that??? I love the photo you did up! and thanks for the kind words about my invisible post! Thanks for sharing the encouraging verse with us on WFW. Have a blessed day! Good post, Nancie. I can never be reminded too much of God's grace for me. Grace means "unmerited favour". There's nothing I can do to earn it, God just gives it to me. His favour is on me, regardless of the state (mental or physical) that I find myself in. What a great God we serve! I love it all sweetie! God bless you! Yes, Paula, it is so encouraging to remember that grace is "unmerited faviour" and God's grace is always upon us no matter what our state is. May He continue to keep you near to Him daily and His love and grace be your encouragements always. Take care! Oh, how I love this verse! And, what a breathtaking picture. What a neat hobby~ the bookmarks are really neat. Thanks for visiting, Tracy. Happy WFW! What a great verse for WFW! Such a comforting word from our Father to ponder...can't ever hear that one too much. That picture is lovely! How sweet that you created bookmarks! = ) Your kindness is truly a blessings! This is so beautiful and a great reminder of needing to learn to really trust God...He's given us all that we need. That's a beautiful picture with one of my favorite verses. Thanks for the encouraging post. Nancie, This is such a beautiful post and so very true. God's grace IS sufficient! Great photograph. I clicked on “Read more” and it says the URL isn’t valid. Just wanted you to know. Thanks, Tracy, Twinklemom, Ellen, Morning Rose, Melanie and Susan, for stopping by. I thought this post was very encouraging. Hearing the word "grace" over and over again is like a message is trying to get through this thick skull of mine. I'm longing for a softer heart. It's amazing what the power of just one word can hold, when it is just listened to. Thanks, Jena, for stopping by. Indeed the Word of God is very powerful and very comforting too! Paula reminded me that Grace means "unmerited favour". There's nothing we can do to earn it, God just gives it to us. His favour is on us, regardless of the state (mental or physical) that we find ourselves in. Isn't that wonderful and encouraging! A good verse to remind me that He is all that I really need. I can see through your post that you have grown closer to the Lord through your illness. I've found that it is in the lonely and depressing times that I find myself reaching out to Him more. Thanks, Ellen, for stopping by :) It is really wonderful to remember that God is all we need and His grace is sufficient for us! Thank God for His love for us. Have a blessed day! I love this photo! I wondered if I could use it for the front of my worship bulletin this week? The text is 2 Cor 12: 2-10 and I am focusing my sermon on verse 9. I don't have bipolar, but I do live with depressive disorder and generalized anxiety disorder, so I am so pleased to see your faithful response to a psychological disorders in your blog! I assume it would be okay since you let folks use it for bookmarks, but wanted to make sure. I will leave the URL on the bulletin to your blog, if that's all right with you. Thanks, Pastor Erin, for your encouragements! Thank God for His goodness and many mercies. Yes, please feel free to use this photo and any other photos that you may find useful on this website for your bulletin, etc. It is such a comfort that God's grace is sufficient for us no matter what we may have to go through in this pilgrim journey! May His grace be ever more evident in our afflictions as we reflect His love and joy to a dying world! Thanks for stopping by! Take care and God bless!